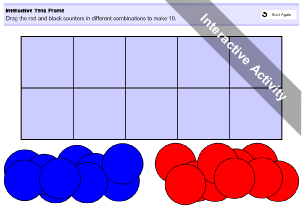 A simple click-and-drag tens frame where children can move the blue and red counters in different combinations that make 10. A simple click-and-drag activity ideal for whole-class teaching and using an interactive whiteboard. 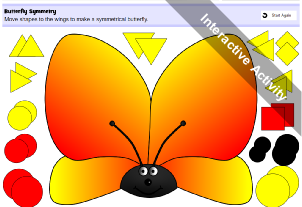 Children drag the coloured shapes to make the butterfly wings symmetrical. A simple click-and-drag activity ideal for whole-class teaching and using an interactive whiteboard. 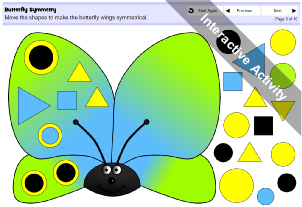 Children drag the coloured shapes and make the butterfly wings symmetrical. 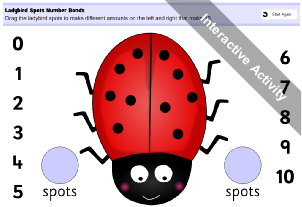 A simple click-and-drag interactive activity where children move the spots on the ladybird wings to make different combinations that total 10. A simple click-and-drag activity ideal for whole-class teaching and using an interactive whiteboard. 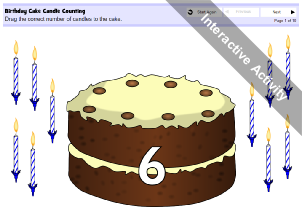 Children drag the appropriate number of candles to the cake. 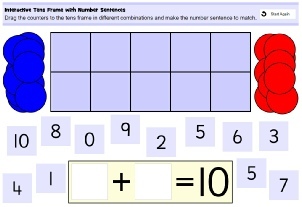 A simple click-and-drag tens frame where children can move the blue and red counters in different combinations that make 10 on the tens frame and drag the numbers to complete the number sentence. 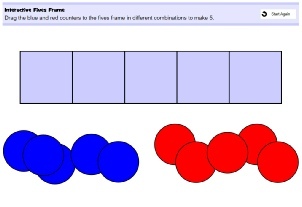 A simple click-and-drag tens frame where children can move the blue and red counters in different combinations that make 5.